Dig & Sift for Egyptian Treasures - From the dusty tombs of ancient Egypt, the Gamewrights bring you a card game unlike any other. 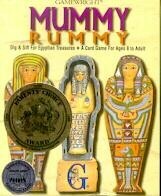 Players dig and sift in search of cards that complete pictures of ancient Egyptian treasures. Certain cards with special power can transform the pictures, and antiquities can suddenly jump from one player to another. Excitement builds to the very last turn! The player with the most points wins.